Passers by will remember your window when it comes time for them sell. If you drive through almost any town or city in the US, chances are you will find a Real Estate office downtown. Why is that? After all, Real Estate isn’t exactly an industry that requires customers to come and shop in a store. The reason why Realtors set up shop in premium locations is the same reason you see them on benches and buses. They want the exposure. They want their past, present and future customers to walk by their office every day. An Interactive Window with WindoVision amplifies and magnifies that office exposure 24 hrs a day! Not only will passers-by be subtlety reminded of their neighborhood real estate office with a passing glance. With WindoVision, the local community is attracted and engaged with a window display they will never forget. In today’s market, listings are GOLD. Not only is inventory tight, but sellers are also becoming increasingly more bold in selling themselves. Big market sites and social networks have made it easier than ever to market homes, cheaply and freely. However, they’ve also become over saturated and over loaded. Sellers and Realtors alike often find themselves awash in a sea of endless listings, unable to stand out from the others. With Windovision, sellers are promoted in a unique and special way that other Realtors simply can not offer. 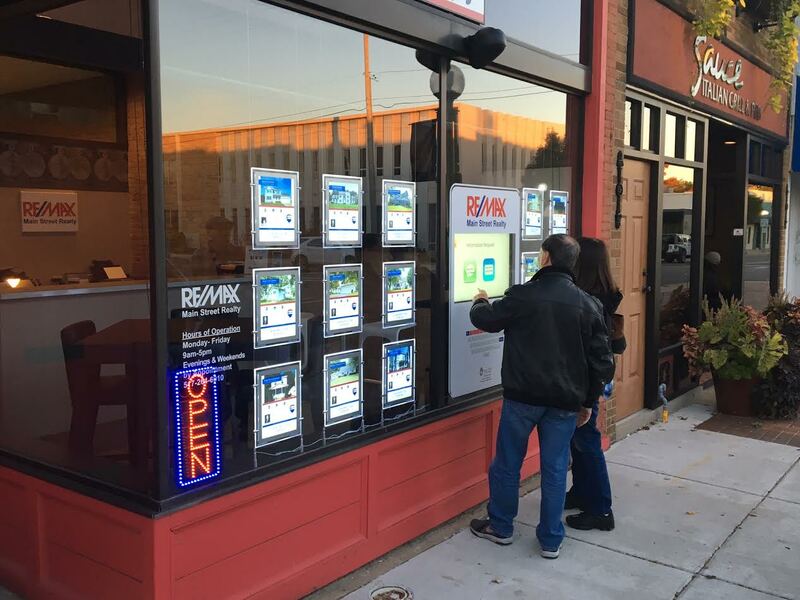 With an illuminated sign and interactive code, potential buyers passing by can view the property tour, visit it online, and request more information 24 hours a day! This one of a kind level of exposure has proven to be an absolute closer for many offices in the pursuit of more listings. Buying a house is a stressful and tense experience. The last thing buyers want is pressure from a commissioned sales person to buy a house that’s not right for them. This is one of the biggest challenges stopping potential buyers from even stepping foot into a real estate office. With WindoVision, they don’t have to! 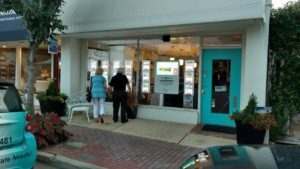 The interactive storefront marketing kiosk allows buyers to search and view listing presentations in the open and non-threatening environment outside the Real Estate office. This makes them much more comfortable and willing to engage with an agent, who can then bring them inside to learn more. If the office is closed or there is nobody to help them, buyers can leave their contact info, which will instantly be forwarded to the office agent assigned. As tough as it is to find sellers and get listings, it may be tougher to find and hold onto good agents. The nature of the profession makes it easy for agents to jump from one office or to another, in search of greener pastures. The Interactive Window with WindoVision has proven to be instrumental in allowing companies to recruit and keep successful agents. Windovision provides a unique platform for Agents to showcase themselves and their listings. As a result, old agents stay and new agents come. Agents also see an increased value in “floor time” with the new potential walk-ins. Listen to what Chad Bishop from RL Infinity International had to say. Home buyers and sellers need more than just Realtors. They need a loan. They need insurance. Almost every home sold needs a home inspection. On top of this, they need painters, plumbers, and landscapers to make the home their own. In the first 6 months of a new home purchase, the average home buyer works with 10 different companies! More often than not, these companies rely on referrals from local Realtors for business. Windovision provides both the realtor and the vendor an opportunity to formalize that referral relationship. In the process, Windovision also allows the preferred vendors to promote their products and services the same way Windovision promotes listings.